Circa 1809. Surrounded by Lancaster County's Pennsylvania Dutch and Amish farm region, this 1818 Colonial brick farm home has been recently renovated to offer elegant and tastefully decorated accommodations in a romantic setting. The entrance hall and living room feature an art gallery ambiance. Antique beds and furniture grace the guest bedrooms that boast hardwood floors. Stay in the first-floor Deluxe Suite, the second-floor Sunrise-Bay Window Room or the Balcony Room. Two sets of rooms can be adjoining. Enjoy a gourmet two-course breakfast served in the Garden Room dining area at individual tables with candlelight and soft music playing. One of the chef's specialties is Pannekoeken- Dutch-style pancakes with a filling. A buffet features an assortment of delicious foods. The gardens include seating areas, a gazebo and fountains. Watch Amish hay baling in the back yard. This property has 10 total guest accommodations, 8 with private bath, 1 with fireplace, 2 two-bedroom suites and 2 cottages. The types of beds available include King and Queen. Deluxe Suite has two-person Jacuzzi. Candlelight room has single-person Jacuzzi and a fireplace for lighting candles. Curved walkways lead all around the gardens from a fountain surrounded by roses and low boxwood hedge and beyond to the gazebo where you can sit on the gliders. The large fountain area offers views to the Amish farm bordering the backyard. Comfortable wing back chairs, antique headboard and dresser decorate this room. The queen-size bed has down feather pillows. The extra large tiled bathroom has a walk-in two-person shower and a hairdryer. This room also has two closets, original hardwood floors, cable TV and telephone. Individual A/C and heating control. Rate for 2 persons. Two person max. No children under 12. 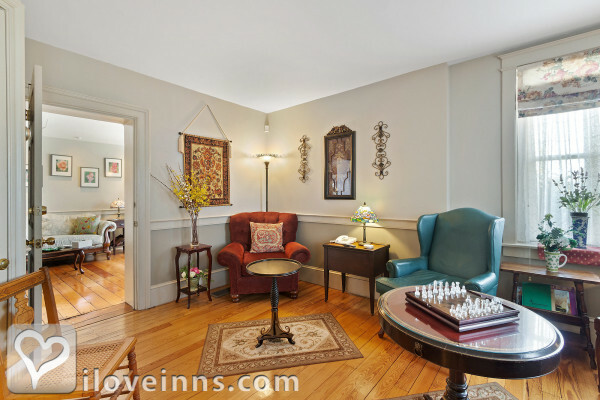 Our deluxe suite provides the perfect setting for your Pennsylvania honeymoon or romantic weekend getaway trip for two, featuring a queen size bed with down feather pillows, original hardwood floors, and a room full of antiques. 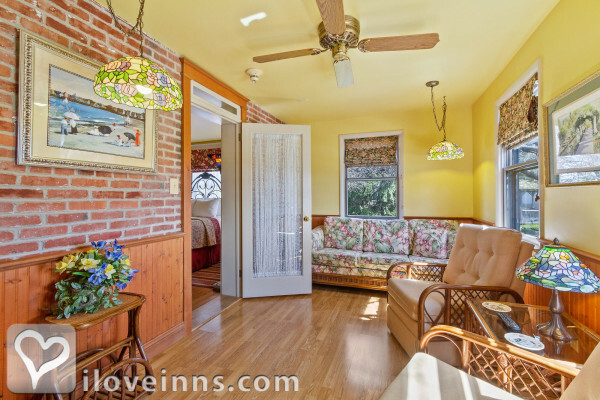 This room has its own separate sitting/sun room with an outside private entrance which can accommodate a third guest if needed on its sleeper sofa. The bedroom includes a TV with DVD and VHS player and telephone. The tiled bathroom includes a two-person whirlpool bath, a separate glass enclosed shower and a hairdryer. The enclosed sitting area has a second cable TV. Enjoy great views of our gardens from both rooms. Individual A/C. Rate for 2 persons. Extra person $25.00 per night, 4 max. No children under 12. 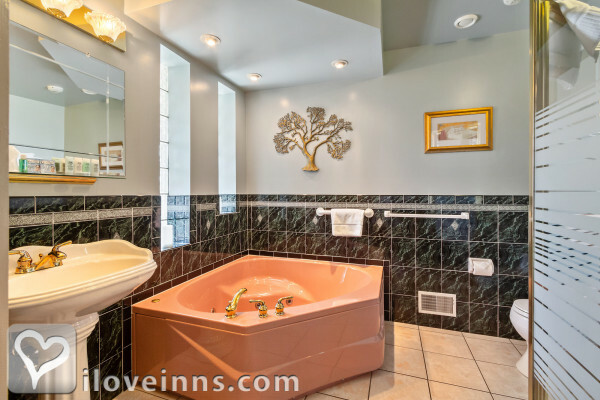 A great cozy room with it's own private entrance on our covered back porch and a spacious tiled bathroom which includes a full tub/shower combination. Located on the first floor it has amenities like a Queen sized bed, dresser with flip-out desktop, individual A/C, telephone, TV and antique decor. Rate for two persons, two person max. No children under 12. Spacious room with great furniture and several seating options. A comfortable sofa can be used as a sleeper sofa for up to two additional people if needed at a nominal charge. Private bathroom has a tiled tub/shower combination. TV with VHS player (bring your own movie or choose one of ours), telephone and individual A/C control are standard. This room adjoins with a double set of lockable doors to room 6 (Bay Window room) if so desired, which is perfect for two couples. Rate for 2 persons. Extra person $25.00 per night. Three person max. No children under 12. Great south-west facing room with wonderful antique furniture. Private bathroom is fully tiled in emerald green and has a glass front shower. TV, telephone and individual A/C are standard. This room adjoins with double lockable doors to room 5 (Sunset room) if so desired. Rate for two persons, two person max. No children under 12. 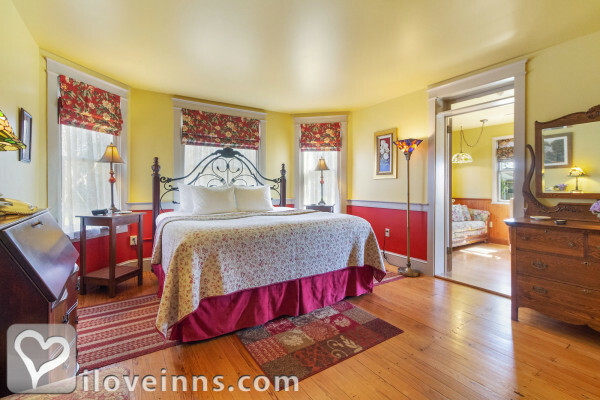 Cozy room with queen size bed, antique writing desk and private balcony overlooking our gardens and Amish farm fields with an absolutely fabulous view. TV, telephone and individual A/C control are standard. 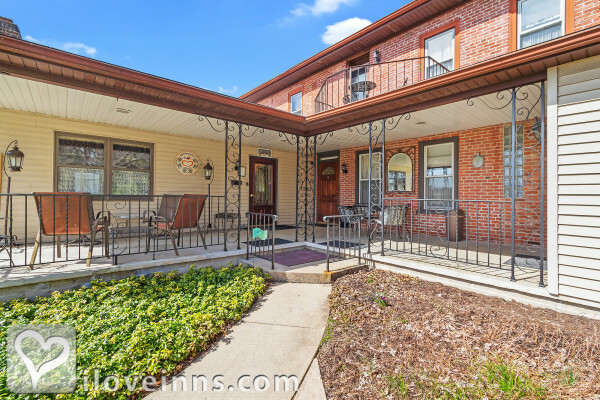 Enjoy your own private balcony overlooking the gardens and Amish farm, cafe table, two chairs and umbrella in the warmer months. Private bathroom is fully tiled and has a glass enclosed spacious shower. Rate for 2 persons, two person max. No children under 12. Very spacious with beautiful views of the garden, fountain and gazebo. Private bathroom has a glass enclosed shower and is fully tiled. Decorated with antique furnishings, this room also has TV and telephone. The room adjoins with a double door to room 9 (Candlelight room) if so desired (normally these doors are locked). Individual A/C control. Rate for two persons, two person max. No children under 12. Looking for a romantic destination for your Pennsylvania honeymoon or weekend getaway? 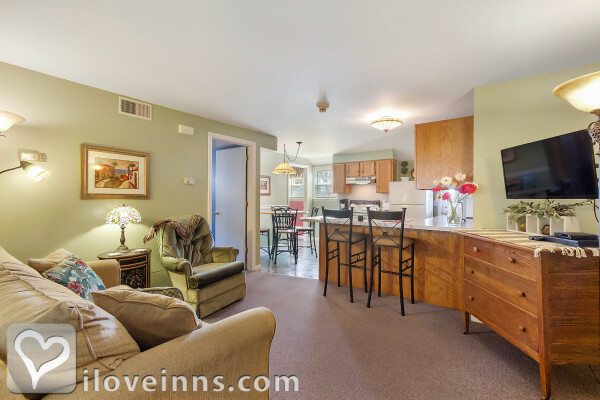 After Eight Bed and Breakfast in Paradise, PA has the perfect room for you! Our Candlelight Room is romantically decorated with a candle filled, antique original, fireplace. An antique settee with matching chairs provided separate seating areas to fit the mood. Queen size bed with fabulous antique headboard, TV built into the wall and telephone are standard. The bathroom is spacious with a single person Jacuzzi/shower combination. Beautifully tiled in emerald green. This room adjoins with double doors (normally locked) to room 8 (Sunrise Bay Window room) if so desired. Individual heating and A/C control. Rate for two persons, two person max. No children under 12. This great 2 bedroom cottage, which sleeps 5 adults or 4 adults and two children, is located on our beautiful B&B grounds at the lower level of our 3-unit split-level annex just 50 feet from the Amish farm fields. It consists of a living room with a pull out sofa, cable TV, full kitchen with refrigerator, dishwasher, coffeemaker, coffee and tea supplies, microwave, stove and dining nook. The bathroom has a glass shower stall and deluxe adjustable shower head. Bathroom also includes a hairdryer. The master bedroom has a comfortable king size bed with fine linens, the cozy 2nd bedroom has a queen bed. The cottage is decorated in cottage decor. Breakfast is included for adults and children over 12 and served in the main house. Families with children under 12 will have breakfast delivered to the cottage. Individual heat/cooling controls. Rates are for four persons, extra persons $25.00 each per night, maximum 6. 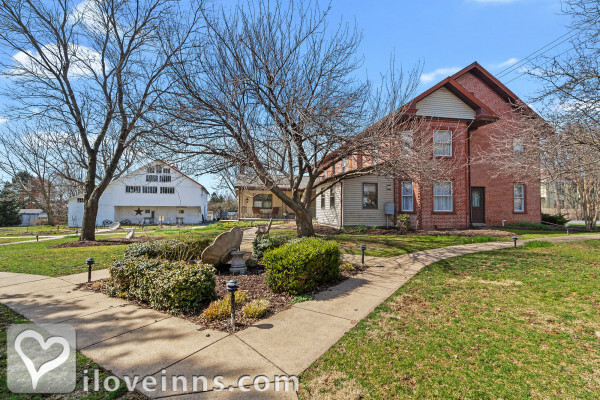 This 2 bedroom cottage sleeps 4 adults and is located on our beautiful grounds about 30 yards from the main B&B building at the lower level of our 3-unit split-level annex bordering the Amish farm fields. It consists of a living room with cable TV, full kitchen with refrigerator, dishwasher, coffeemaker, coffee and tea supplies, microwave, stove and dining nook. The bathroom is equipped with a tub/shower and hairdryer. The bedrooms have very comfortable Queen size beds with fine linens. The cottage is decorated with a combination of antiques and cottage decor. Breakfast is included for adults and children over 12 and served in the main house. Families with children under 12 will have breakfast delivered to the cottage. Individual heat/cooling controls. Rate is for four person, four person max. Iron Horse Inn, Stockyard, Molly's Pub, Checker's Bistro., Press Room, Old Greenfield Inn.. The dates this property will honor the certificate are Jan. 2 - March 30, Sunday-Thursday. No holidays or weekends. Does not apply to Cottages..
We found the After Eight Bed and Breakfast quite by accident, but it turned out to be a wonderfully lucky find. The house is beautiful with comfortable living room and parlor decorated with antiques and much art. The bedroom was also comfortable as well as lovely with a huge, modern bath. Breakfasts were amazing and Robert, the innkeeper is a gracious host. He had lots of sightseeing tips for us and made our time perfect. My stay here was excellent - service, comfort, food, etc. Robert is a wonderful host with a warm, pleasant, and inviting personality. I would highly recommend After Eight Bed & Breakfast to family and friends. 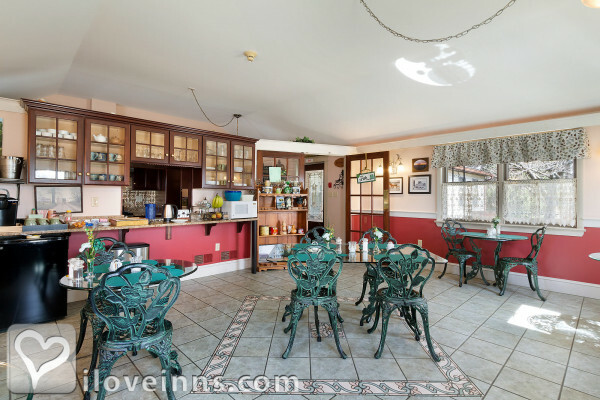 I wanted to give some feedback regarding the After Eight Bed & Breakfast in Lancaster, PA. I've never been to a B&B before so this was my first experience and I'm so happy that After Eight was the first place. The location was perfect, the food delicious, the hospitality wonderful, the rooms quaint, cozy, and perfect. Robert Hall is the innkeeper and he was absolutely wonderful. His morning "entertainment" was a treat; I loved his sense of humor and laid-back demeanor. He was so easy-going and personable. I would (and have) recommend After Eight to my friends and family and I DEFINITELY plan to go back soon (possibly this fall).